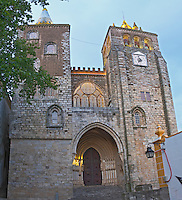 Evora, Alentejo, stock photography samples, by Per Karlsson, BKWine. Evora is the central city (or town, it's not that big) in the Alentejo wine region (as well as administrative province). It has a bit over 40,000 inhabitants. It has an old city centre with narrow cobble stone streets, old buildings, white-washed houses and many charming things to discover. It is on the UNESCO list of World Heritage Sites. Evora has a history that goes back more than 2000 years. Perhaps the most notable historic monument is the Roman temple, a well preserved ruin today. There's also the Santo Antao Church on the Giraldo Square (Praca do Giraldo) with its elegant archways and 18th century fountain. It's a good base for excursions into the wine country.